When Dr Alexander Thom died in 1880 a meeting was held to decide on a memorial window and some called for a cheaper glass than Morris's but Henry Whitehead, the vicar, would have none of it. He claimed he was acting for posterity in insisting that it be entrusted to Morris, and that in time to come the people of Brampton would approve his action. 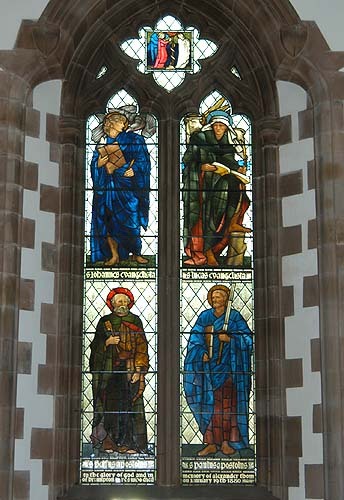 The window consists of four large figures, (clockwise from top left) , St John the Evangelist, St Luke, St Paul and St Peter.